Planning traffic flows is an essential part of event planning and must be taken into account when constructing and operating event venues. In addition to road network efficiency and public transport performance, safety aspects play an important role in pedestrian traffic planning. PTV Transport Consult supports businesses in creating traffic and security concepts for major events, trade fairs and public buildings such as railway stations. 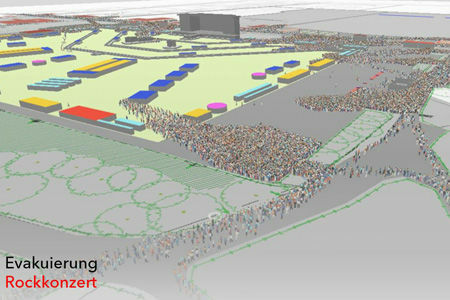 For the AC/DC concert at the Jahnwiesen 2015 in Cologne, the assignment was to perform pedestrian outflow and evacuation simulations for the rock concert with 80,000 visitors. The task of PTV Transport Consult was to carry out microsimulations for standard pedestrian outflow as well as for an evacuation of the concert site in order to uncover security weak points and - if necessary - to develop optimisation measures. During microscopic simulations, plans of the organiser such as site plans and event concepts were modelled and calibrated using the software PTV Viswalk (Link!). Any additional information available, such as walking and standing areas, fixed and mobile obstacles, surrounding road race courses, etc. was also included. After simulation and evaluation of the pedestrian outflow scenarios, PTV's experts discussed the congestion scenarios that arose and, among other things, suggested adding an exit at a certain point to relieve congestion on the staircases. The optimisation effect was then validated through microsimulation and implemented for the actual concert event. This simulation is exemplary for many other simulations of pedestrian flows at major events with different issues.